There are thousands of navigation apps on the Google Play Store, apps that are perfected for outdoor navigation. But what about the indoors, such as shopping malls, stores and other indoor places? Well, now you can have almost all shopping centers in Toronto mapped in one single app. We’re talking about Mapsted Navigation, our Navigation App of the Month. Mapsted Navigation is a free, indoor navigation app developed for Android (soon to be published on iOS). The app is straightforward, easy to use, light and battery spearing, providing an amazing user experience. Mapsted Navigation is the solution for navigating yourself trough those enormous and busy shopping malls in Toronto. No more wasting precious time trying to find your favorite store, product or the restroom while walking aimlessly through the malls. All that’s required from you is to download the map for the shopping mall you’ll be visiting and Mapsted Navigation will lead the way. Mapsted Navigation maps are detailed with the location to all the stores, services kiosks, restrooms and other amenities in the building. It shows you all the locations in the mall, the locations of the places and stores you want to visit and guides you step by step anywhere you need to go. 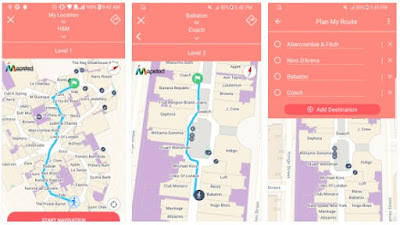 Mapsted Navigation is completely free and does not require usage of Wi-Fi or mobile data connection to work. All you need to do is download the map of the mall you will be visiting and you are set to go. The app is lightweight and will not drain your battery. It also uses a patented technology for providing accurate step-by-step indoor navigation. The app will even recognize when you enter a facility and will launch its self automatically. With Mapsted Navigation you and search for your favorite stores, products and services within the mall by name, category or type. You can also create your own custom profile by entering your shopping preferences, interests and other information, so it can deliver you a better shopping experience with info on current sales, special offers, etc. The developers of the app are currently working on updates which will add new maps for hospitals, university campuses, airports, convention centers, government complexes and many other indoor facilities. This makes Mapsted Navigation quite a unique and valuable app. You can find, download and install Mapsted Navigation for free at the Google Play Store.